Learning how to cook polenta will open up a whole new range of exciting meal ideas suitable for both vegans and vegetarians. This versatile food is easy to prepare and has the added benefits of being both nutritious and low cost. Polenta is made from cornmeal. It is a type of gruel or porridge and, while this may sound unappetizing, polenta can be a rich and tasty accompaniment to a wide variety of dishes. Polenta can be cooked in a variety of ways and this means that it is perfect for use with both savory and sweet dishes. Polenta is relatively bland. Seasoning can be added to the basic ingredients, however traditionally this bland flavor was used as a balance to highly seasoned meats and vegetables. When Italian families prepared polenta at home, they would have special pans and stirrers that they used to cook the polenta. It can easily be prepared at home, however, using normal saucepans and cooking spoons. The ingredients are very basic. Just ground cornmeal and water are required to make polenta. Other ingredients such as seasoning, oils or butter, or other ingredients can be added if required. The ration of water to ground cornmeal is generally around three parts liquid to one part cornmeal. When people are wondering how to cook polenta at home they need to consider the time as well as the ingredients required. Polenta needs to cook slowly and can take an hour or so to cook using the traditional methods. It needs to be watched during this time to make sure that it does not burn. Constant stirring is required to stop the polenta from sticking to the bottom of the pan. This makes it relatively time consuming to prepare, however the end results are worth it. There are ways of cooking polenta that are more convenient than the traditional methods. One is the method of cooking polenta in a slow cooker. This is ideal for busy people as the cornmeal and water can placed into a slow cooker and left to gently cook over a period of several hours. This means that it can be left to cook while people are at work and it will be ready to serve with an evening meal. While slow cookers are one modern way to make the cooking of polenta more convenient, microwaves are another way to prepare polenta. Instead of slow cooking the cornmeal, this is a quick way to prepare soft polenta and is ideal for days when time is short. To cook polenta in the microwave, simply mix the water and cornmeal and place this in a microwave proof bowl. Turn the microwave to 'high' and let the mix cook for about eight minutes. Remove the polenta and let it stand for a period of five minutes before stirring it well and returning it to the microwave for two more minutes. The precise timings will depend on the type of microwave. 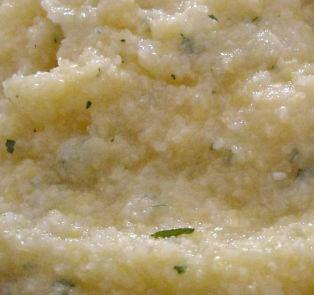 Cooked polenta can be served as a soft dish or left to harden and fried. When polenta is fried it becomes crispy on the outside and remains soft on the inside. The polenta can be cut into slices and layered with cheese and baked or covered with fruit and dairy or soy cream and enjoyed as a desert. Learning how to cook polenta can ensure that vegetarians and vegans always have access to this versatile food at home. Whether it is cooked quickly or slowly, using traditional ingredients or with the addition of flavorings or extra ingredients, this is an exciting food option and one that can be enjoyed with many different meals.